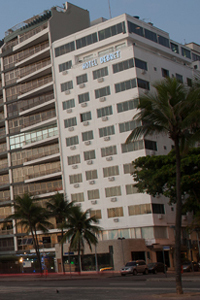 Situated in front of Leblon Beach, one of the most beautiful and charming beaches in all of Rio de Janeiro, the Marina Palace Hotel is close to the city’s major shopping centers, night clubs, and restaurants. Distinguished by its “Class A” service and commitment to elegance and comfort and hotel has 150 rooms all well suited for those travelling for business or pleasure. All rooms feature Cable TV, central air conditioning, and internet access. Also available for the guests enjoyment is a swimming pool located on the oceanside terrace, sauna, fitness center, laundry service, concierge service, beauty salon, and beautiful views of Leblon and Ipanema Beach, Lagoa Rodrigo de Freitas, Pedra da Gávea, and the Corcovado. When would you like to stay at Marina Palace Hotel ? 1) Rates at the Marina Palace Hotel may not be valid during Carnival, New Years, Easter and other special dates.